CATALUNYA has elected Carles Puigdemont as its new president, ending a three-month political stalemate. The new head of the region’s government pledged to continue with Artur Mas’s separation campaign. Mas stepped aside on Saturday after fellow secessioinist party the CUP failed to provide him with the necessary support. 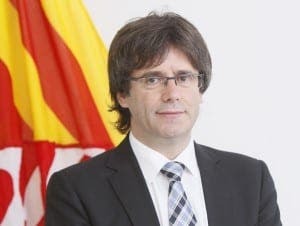 Puigdemont, who was formerly the mayor of Girona, was voted in by 70 votes to 63. Both the PP and the PSOE are opposed to offering Catalunya a referendum on independence. I find it interesting how in the UK, the Scottish are given the choice to stay or leave the union (as is fair and correct) but in Spain, you need all regions to agree to allow one region to secede from the union. How crazy is that? If people don’t want to be in your club any more, I don’t see how you can force them to stay, nor is it fair or correct to try to do so! This law was made in Madrid and dictated to the rest of ‘Spain’. Unless you study the history of Iberia you will never get to understand what is going on today. The UK was set up by the invading Aryans, against the will of the Celts in Scutia,Erin, Kernow and Cymru. The Act of Union (Scotland) was agreed by a bunch of lawyers in Edinburgh for hardly more than a handful of silver and all were Protestants who did this to spite the Stuarts who were Catholics – the evil hand of religion again. First the Norse (Normans) invaded Erin because the Gaels dared to help their Celtic brothers the Britons in Cymru and later Cromwell and his brutal killing campaigns. The Irish at last have their freedom and the Scots too would be free but there were too many cowards who allowed themselves to be frightened into voting no. They should of course have declared UDI in 71 when the extent of the oil fields were known, it would now undoubtedly be the richest little country on earth – esta la vida. Cataluyna and Pais Vasco were both invaded by the Aryan Spanish of the centre regions. They were not and are not willing to be part of Spain. Even when they get their independence it will take a long time to root out the infection of Spanish corruption. The pero castillanos don’t have what Franco and his Fascists had, huge support from Hitler and Mussolini. If the Francista Generals are stupid enough, they will want to invade Cataluyna. It would be a fatal mistake and would leave the centre Aryan and Semitic south as destitute places that would need an awful lot of subsidies from the EU to keep them afloat -vamos a ver. To assimilate the situation for Catalonia with the situation of Scotland is unfair. Scotland was a kingdom that joined with the kingdom of England by a treaty . A treaty can be derogated. Catalonia was a county of the kingdom of Aragon. The kingdom of Aragon merged with the kingdom of Castilla by marriage of the Catholic Kings. We should declare invalid that marriage? The Basque lords – there was no king because that country was a little primitive – made vasallage voluntarily to the King of Castilla. They were not invaded. Catalonia in the century v was invaded by the Visigoths. These ones were first in Catalonia and later they invaded the rest of Hispania. In the century VIII the Arabs invaded all Hispania. With the time the Francs pushed to the Arabs to the south, and created the “Marca Franca”, a land comprised between the Pyrenees and the river Ebro. Catalonia was a set of counties that was in the Marca Franca- Before all this lands belonged to Al Andalus. With the disintegration of the Franc Empire, the county of Barcelona absorbed the rest o the counties of Catalonia, and began to act as if She were independent. But the Count of Barcelona continued making homage to the king of France. In the Century XI the County of Barcelona was integrated by marriage in the Kingdom of Aragon. The Spanish Civil War was a war in all Spain. Originated by a failed coup, due to political reasons. That coup failed in all the big cities because in these, there was a strong presence of trade unions, who armed to their affiliates. And, yes, probably without the generous aid of Italy and Germany and, we must not forget it Stuart, the covert contribution of the United Kingdom , France, and the United States. The forces of Franco won the war. According with genetic studies (EUPEDIA), your claim about “the semitic South “ and the “aryan Center “ lacks of any relation with the facts. Catalonia is part of Spain, and to speak about his secession is so absurd as to speak about the secession of the Yorkshire.